The groundbreaking and innovative PokerStars software is free to download and available for Windows/PC and Mac/Apple. It’s constantly being improved by our team of experts, adding new features based on your recommendations, to make sure you continue to get the best poker playing experience anywhere online. You can even play in a wide selection of local currencies and languages, with new ones being added all the time. Check the Getting Started page for more. PokerStars offers the widest selection of Internet poker games across hundreds of tables, including Texas Hold’em, Omaha, Stud, 2-7 Triple Draw, Badugi, plus mixed games like HORSE and 8-Game. All games are available at stakes that suit players of all skill levels and bankroll size. 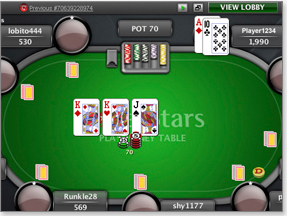 No matter what kind of online poker game you’re looking for or how big you want to play, you’ll find it at PokerStars. PokerStars allows you to make easy, quick and secure real money deposits with a wide selection of options, plus fast cashouts, or you can play for free. We’re also fully licensed and regulated, so you can stay focused on your game, safe in the knowledge that your money is always taken care of. Everything is backed up by the award-winning PokerStars Support Team, on hand 24-7 to answer your questions and handle any issues.